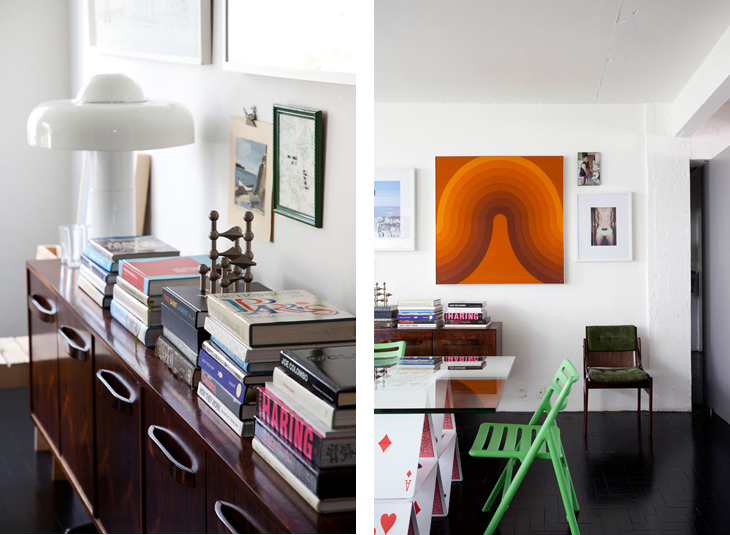 Design Addict Mom: A residence in Brazil. 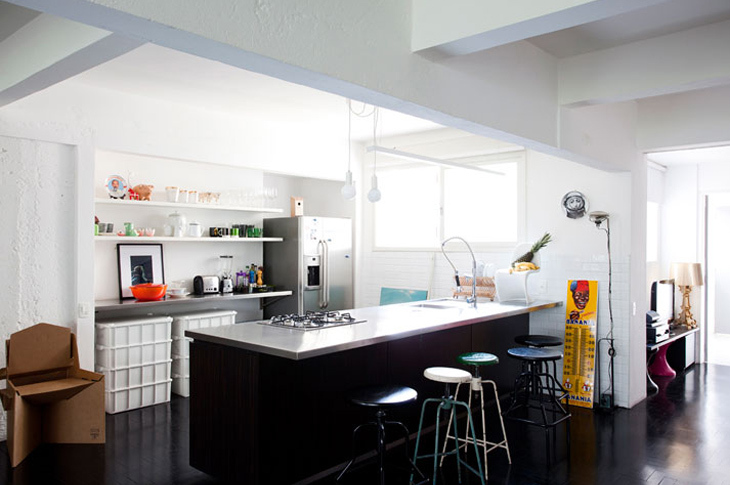 This renovated loft in Sao Paulo reflects the creative imagination of its owner, Mauricio Arruda. The living room alone indicates this. I love his mix of varying materials and how he layers his space. Of course the pop of colour everywhere enliven the spaces beautifully. 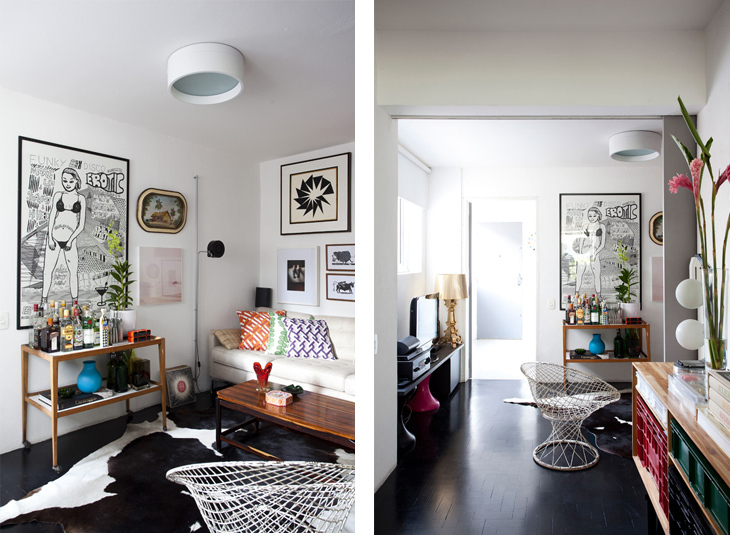 Above all else are the black painted floors that allow the furniture pieces to take center stage. Crates make perfect storage containers here. Unexpected and fun. check out the card inspiration for the base of the table. loving the pop of green too. a better view of the dining space. The whimsical card table is so fun- thanks for sharing! 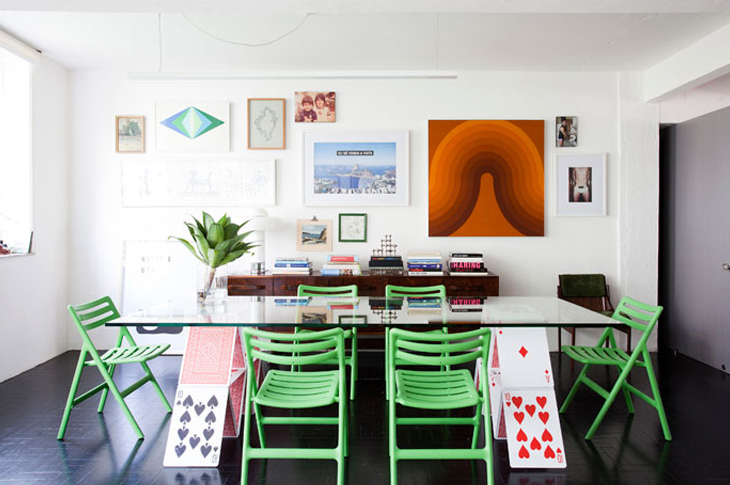 What a fun and happy space...adore all of the pops of color and the dining table...genius!! its so eclectic & a little cluttered, which is generally so not my style.. but it's not overdone & I could see myself loving it. haha! "Les enfants n'ont pas besoin de critiques; ils ont besoin des modèles." - "Children do not need critics; they need role models." HERE HERE. holy sh*t balls - i'm in seriously pitter patter right now! - THOSE cards as legs - HELLO where do u get them?! - and OMG that reg bag/basket - PERFECT for my house to throw my shoes in when i walk inside my house - there's just SO much to love - alll me - thanks babes for the post - i'm getting LOTS of creative energy running through me now!!!! that table is amazing- love the cards- and the crates. Such a fun place. I imagine their guests have a hard time not spending the whole visit looking around the house. I agree with everyone, this is a fun space. The bright colors work so well with the black and white. Love the idea of a painted floor, but not sure about black! it does work here though! I can tell you like a splash of color. We are excited to be included in HGTV's Freebie Friday giveaway tomorrow. We are giving away a cool Asian lacquer coffee or low side table in one of 5 color options, so come on by for a chance to win!! Its worth upwards of $500.00 so its our biggest yet. Oh, cool but a bit too much color and stuff for me. I really really like that sideboard with the books on top of it, swoon. that kitchen is so cool! i love how open it is! i love the card table! it's sooo unique and so fun!! That's what I call living like you! What a fun "card" table! Don't you just know that the living and conversations in that home are rich and interesting! The card table is killing me with it's cleverness! What fun - you would never tire of first-time visitors going "wow!". Whole place is fabulous - so eclectic and quirky. Wow that card table is off the hook! I just love it! What a fun but still clean and contemporary space!